Welcome to our “Becoming Your Best” listeners, wherever you may be in the world today. This is your host, Steve Shallenberger and I’d like to start out with a few questions. Today, how many of you and I would like to have peace, happiness, and joy in our lives? Well, that’s kind of a stack question, isn’t it? Well, of course, we want to have peace, happiness, and joy. And how many of us would like to have employees or children that are focused, engaged, aligned with the things that matter most, and excited about what they’re doing, and they solve problems rather than you having to solve the problems? Well, yeah, wouldn’t that be great? Well, today, I’d like to help us accomplish these things, talk about a process that’s called the “Strategic Rhythm.” And this is in contrast to a strategic routine, which is much different. A rhythm is a positive force that we get into within our own life. 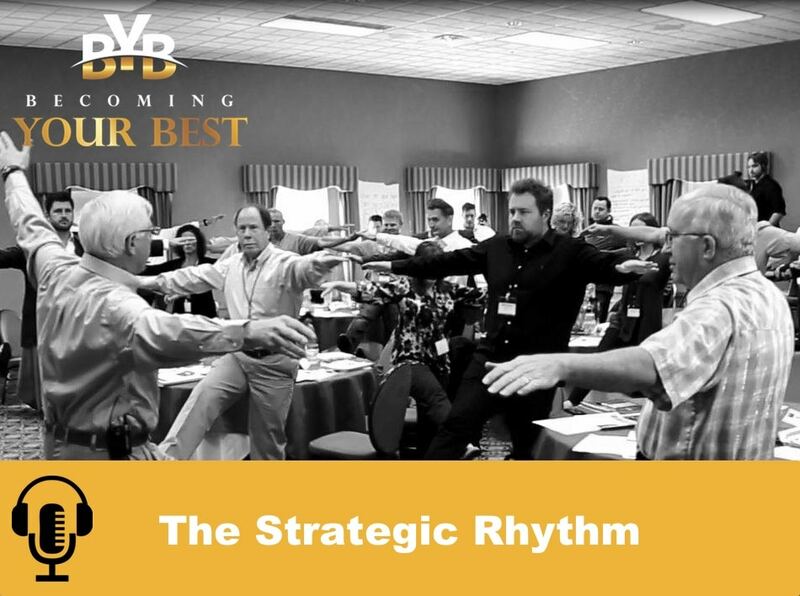 In this process, I’m going to talk about the strategic rhythm. It’s something we can apply in our life to produce that rhythm, or in a family, or certainly, in our teams and our organization. And it is built upon the principles of Becoming Your Best and the 12 principles of highly successful leaders. So as we master those, this strategic rhythm is really what leaders do to get the result but they use these, the 12 principles of being true to character and leading with a vision, and managing with a plan, knowing how to prioritize our time. And these things create a transformational leadership. They’re the very same principles that allow us to use this strategic rhythm process to get this kind of results that I just talked about. Or the 12 principles in regards to creating transformational relationships and cultures such as living the Golden Rule and conscientiously building and maintaining trust. And one of the things we can do to help us do that is to be an effective listener and really capture. “Oh, thank you. Thanks for sharing that or bringing that up and so let me be sure that I have it,” right? And then the fourth principle in that transformational team and relationship is innovative or innovation through imagination. This is the culture, then, that just creates this energy of excellence and adapts. And then, of course, the last 4 of the 12 would be transformational living. And it is to be accountable where we take responsibility, we apply the power of knowledge, we live in peace and balance, and we never give up. So these 12 principles come together to create a magic and is producing phenomenal results. It’s how they come together that unleash a culture to excellence. Okay. Now, back to the strategic rhythm and what we can do as leaders. In your mind’s eye, if you can imagine a pyramid, a one-dimensional pyramid that you’re looking at and it has seven levels. And I’d like to just describe each one because we put these pieces into place as a leader and what they do is that they unleash a huge focus and potential. So the first rung up on the very top of the pyramid, the first level, is leaders create the vision. So that’s why I said it’s built upon the 12 principles. So is there an inspiring vision that establishes the purpose and cause of the organization, or the team, or even in our own life? And remember that the vision, as a reminder, points to the direction that we want to go. In the next level, if you will, right under the vision is what are our core values and standards? And essentially, this establishes our character and the guide that, really, we operate by. On an individual basis, it’s very much a character. Within an organization, it’s the culture and character that come together. These two are extremely powerful because now we have a direction we’re going and we have our mores that, in other words, this powerful guide, a basic fundamental values to guide us that direct us. So the next level and in fact, the levels three, four, and five, as you go down the pyramid, they all have to do with the principle of manage with a plan. So we established the vision, the first level. We’re sure that we have strong core values. So for example, we don’t lie, cheat, or steal, nor do we tolerate anyone that does. Or another core value is safety is not a program. It’s a way of life. And of course, the 12 principles would be among those type of core values that give us direction, or a team or an organization direction. Now, the third level is something we call a TIG, totally inspirational goals. Well, what this level does is set up a target. And it’s a shorter range. The vision, that’s where we’re going over a long term. The TIG, totally inspirational goal, is what are we gonna accomplish? What do we hope to accomplish in the next two to five years? And it should cause us to wake up and just be totally inspired. One of our really wonderful clients and a very successful company headed by Jean Henri Lhuillier in Manila in the Philippines. So for example, the vision for their company is to be the best. And then, they have these core values, the type that we just talked about. Their TIG, is currently, out of the 100 million Filipinos in the world, they serve 1 out 15. Well, as they got together and they were talking about this total inspirational goal, they decided that it would be to serve 1 out 3 by 2020. I mean, this just takes your breath away. It’s so exciting. And what it does is it points all of their key executive leaders, their regional managers, and their thousands of employees in that direction. It just unleashes potential. So this is an example. Another one of our clients works within the energy services industry and they’re in several marketplaces. Well, what they have done and said, “We are going to be in four market segments in each one of the locations that we serve in, and we are going to work to be one of the dominant…to be the dominant player in each of these four segments.” I mean, this also is a huge TIG for this organization. It shifted their thinking. Well, that’s an example. We can have one for our family. Someone may want to learn how to play the piano within the next two to five years on a personal level. So whatever it might be. 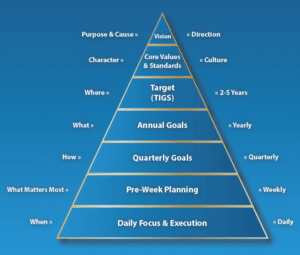 The next rung, the next level, level number four as you move down, it’s almost in the middle of that pyramid, would be the practice of setting annual goals. So this would be on a yearly basis and it decides what you will be doing. And for those who are familiar with the Becoming Your Best principles and processes is when we talk about annual goals or SMART goals versus generalized goals or something…so, for example, “to read more books,” that’s kind of a general goal. It’s a good goal. However, watch how this SMART goal, which is specific, measurable, achievable, relevant to your vision, and time-specific, changes behavior. “Read 12 self-improvement books by December.” See, that is much different and it changes behavior and so we, as leaders, need to teach that to our associates because we’re 90% more likely to achieve something when we have a clearly written goal. And yet, only 10% of us have clearly written goals. And understanding that is a powerful message for parents and for us as leaders. Now, in an organizational sense, then we set these goals in place. And on an annual basis, whether we have a step away for an annual retreat, whether it’s close to where your office is, or it’s in a different location, you review how it went last year and then what are our goals for this coming year? If it’s on a personal basis, remember that a huge way to increase your chance to accomplish those goals is to share them with other people. And the statistics is that you’re 34% more likely to achieve something when you share your goals because it creates an accountability and involvement with other people. The next rung down, as we move down the pyramid, this would be number five, quarterly goals. Especially in an organization where we get together and every quarter, we go over, “How did we do last quarter and what are our goals for this coming quarter especially as they align with the upper part of the pyramid?” Well, what this does as you and I as leaders go through this process, it literally creates an engagement with all employees. It’s really hard for anyone to sit on the sideline when we set up this process and then we’re able to help bring out the best within individuals and teams, and it creates an accountability. And then, of course, from these quarterly goals that we have, we manage on a monthly, weekly, and daily basis to be sure we’re hitting our key performance indicators. Okay, now, down to the last two levels. Level number six is one that brings the whole process together to now, each week of our lives, and that is doing in a weekly alignment meeting with your team and pre-week planning. Now, this establishes each week what matters most. And it’s done on a weekly basis. Now, we’ve talked a little bit about pre-week planning in the past and drawing the analogy of a pilot that wouldn’t dream of going into the air without having a mission where are they headed and a plan, a checklist they’ve gone through where they’ve checked the weather, they’ve checked the coordinates of the trip. They’ve checked their equipment. No pilot would dream of just jumping in the airplane, going up and flying to their destinations. Too risky. There’s too many things that would happen. Well, the same thing applies for us in our weeks. It’s just too risky to not do a pre-week planning. When is it done? It’s done sometime during the weekend, whether it’s Friday afternoon, at the end of your day, before you leave work. Or sometime on Saturday or Sunday but definitely before Monday morning at 8:00 a.m. because it’s too late. The crisis already starts. And so, once again, if you haven’t seen the Becoming Your Best planner or organizer, you can go on to the becomingyourbest.com website and check out our Best of Class planners. And they’re already set up to help you do this pre-week planning. And it’s a weekly layout. And across the top, what we invite you to do, once again, is think of each role. What is your role and what matters most this week? Set goals by that role. And then when will you do it? You put it down in the calendar. And literally, what you’re doing is you’re scheduling your priorities first in each key area of your life. And then, we prioritize our schedule, the meetings and things that we have to do. Well, what happens as you reflect and ponder and think about your week of how to have a great week before you ever start it? You’ve really gone through what is gonna make a great week and it’s balanced and you feel at peace and you stay at it. This is totally a leadership component and it turns, really, all the other time management processes on their ear in terms of effectiveness, so this is a huge deal. And when you start the week, think of how different you feel when you’ve done this. It literally helps you…give you confidence and focus and be at peace, you’re gonna be doing the right things, you’ll feel greater happiness, less stressed. So I invite all of our listeners to really work to do pre-week planning especially as we’ve outlined it. First, think of your roles, what matters most, and set goals by those various roles and then sketch it out. See how it feels. The last level of this strategic rhythm that we set up is daily focus and execution. This is done, of course, on a daily basis. And I’d like to recommend just four things that we can do. Number one is that you think, when you start your day, look at it in the context of the weekly plan that you’ve already done which is totally aligned, by the way, with the other five levels of this pyramid above it. That’s why it gives you such a tremendous alignment and strength and focus. And number three is chair fly your day. Chair flying is a pilot term and it’s something that pilots do before they go in the air, and they actually just get in the cockpit or sit in a chair and actually fly their whole mission with their eyes closed without ever starting the jet or the plane. And they see themselves, they smell the smells in the cockpit, the smell of the fuel and they touch the equipment. They look around. And now, in their mind’s eye, they actually see themselves starting the aircraft, taking it out to the runway, doing their final checklist. And particularly in the fighter world, looking at their wingman and they line up to take off and it’s full throttle. And they see themselves lifting off, look back at the wingman and everything is proceeding as it should. They think of any with their eyes closed, any possible emergencies, what you might do. Up in the refueler, they do the refueling. Go up and see the mission, the target. They see their target, they roll out, pickle. And then, return to the base. They see themselves landing and having a successful mission. Well, this is the same thing we can do on a day-to-day basis. We anticipate things that can come up. And now when we start the day, we’re ready. And last of all, as each day by doing these things, these little things of meditation and reading and prayer, exercise, these things and chair flying and getting ready for the week, they create, really, a private victory that gives us added personal strength and focus. And allows us to be more successful as we interact publicly with others. So that’s it. That’s the strategic rhythm. It is a powerhouse. If any of you would like to receive the graphics of this, just write to me on the email at Becoming Your Best. It would be steve@becomingyourbest.com and I’d be happy to send out the graphics that shows you this. Well, that’s the message for today. We wish each one of you the best in all that you’re doing. One person can make a difference. And it only takes one person to do this. Thank you and we’re signing off for today. We wish you a great day.